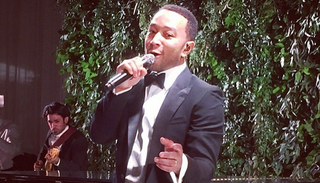 John Legend performed at a wedding that wasn’t our wedding. What gives? Legend was recently hired to sing his treacly wedding classic “All of Me” at the nuptials of Sunitha and Sridhar Reddy in Huntington Beach, California. At one point during the performance, the groom lifted his bride and spun her around the dance floor—the perfect way to punctuate such a sweet moments [sic]. Legend previously offered his wedding singer services in a charity video, so this must be his side job now. Congrats, I guess, to the newlyweds who got this lovely serenade.